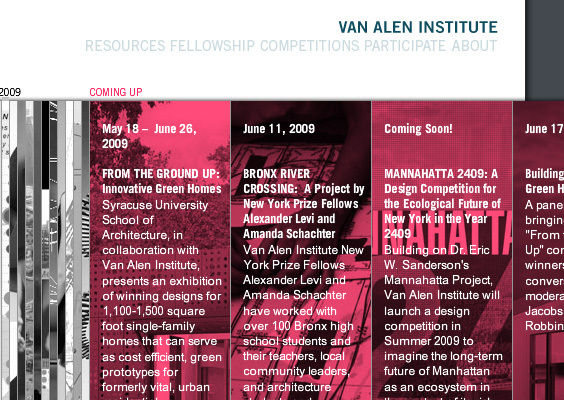 We have been working with Van Alen Institute for the last two years on a variety of web site related assessments and projects. 6 months ago we launched the first version of their current web presence. We are happy to report that on Friday, we launched an improved version of the calendar – a key interactive feature of the site. The calendar is now faster and more fun to use and displays multiple upcoming events at a glance. To a certain extent web sites are never finished. If you are really dedicated to creating a presence that will draw people back time and again then a site needs to evolve as users interact with it, provide feedback or new ideas emerge.